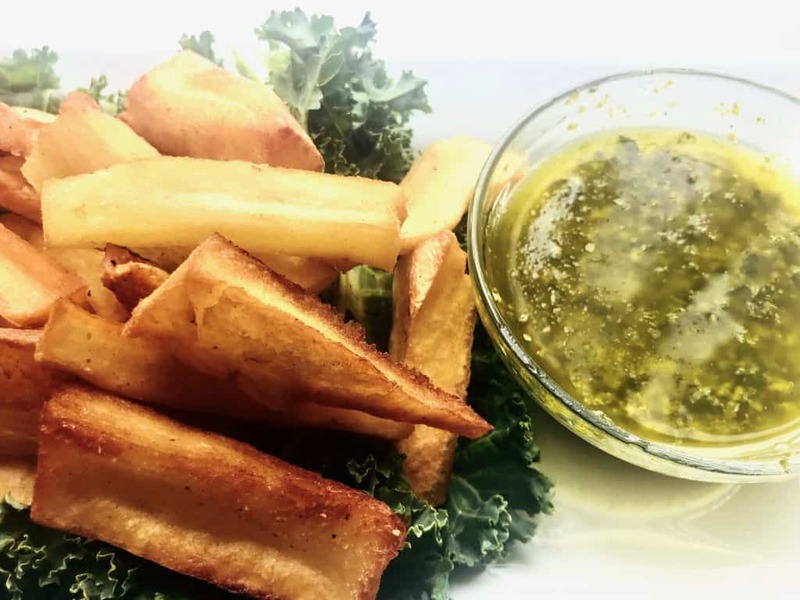 Golden Crispy Fried Yucca Fries Homemade Basil Pesto Dip. Seriously addictive Fried Yucca Fries. Fresh. Crispy on the outside. Soft on the inside. Extra virgin olive oil. Accompanied with Homemade Basil Pesto Dip. Fried Yucca perfectly seasoned with salt and pepper to taste. Crowd Pleaser! Hello, my lovely foodies. I hope everyone had a great Easter weekend! Ours was pretty low-key and was spent with our closest family – just the way we like it! Prior to the weekend, I was telling my friend I had fried yucca fries on my mind. So this past weekend, I was determined to make fried yucca fries. I haven’t had it for so long and for some reason I thought it would have been a perfect addition to Easter dinner. As always, great conversation over wonderful food. Not to mention it was my birthday weekend as well. Seems like the older you get, the less you count the next number that’s about to embark on you. But leave it to the kiddos, they are always there to remind you of your age! I spent the entire weekend being reminded by my lovely children of how old I was turning – ha! As much as I tried to relax over the weekend, a lot of the weekend was spent prepping for Easter dinner. Still, I had fried yucca fries on my mind! Hubby is also in the process of painting the house, which started on Friday. Imagine trying to prep for Easter dinner while operating around paint brushes and rollers. Not fun at all! Everything looked so chaotic in my kitchen I had to take a picture and send it to my friend so she could virtually help me cope with the chaos lol. Fortunately, it was not as chaotic as I imagined it to be once she reminded me that I was getting what I wanted. Which is for the house to be painted. We were able to provide a nice size selection of satisfying food to fill not only our guests for Easter dinner, but we had a small amount of leftovers for them to take home for enjoyment during the week. Remember, I had fried yucca fries on my mind. So, from there it was pretty easy to build on the menu. On the menu, this weekend was rice with lentils, lamb, macaroni and cheese, green beans topped with parmesan cheese, fried plantains, brownie pie covered with coconut icing and topped with strawberries and walnuts, deviled eggs which my lovely sis made, and of course golden crispy Fried Yucca Fries accompanied with Homemade Basil Pesto Dip. The fried Yucca fries were served as appetizers. For drinks, we had lemonade for the kiddos and I used my friend’s Red Wine and Berries Lemonade recipe. My family is not a big wine drinker. The fact that they kept on going for more meant that this drink was on point! Unfortunately, I had to modify the recipe because I did not have the same honey she used, but it still came out just as great. I can’t wait for summer barbeques to try this Red Wine and Berries Lemonade recipe again and accompanied it with my 4 Ingredient Chutney BBQ Chicken. YES! I could just taste everything now :). Want to introduce fried yucca fries to the table? If you are not familiar with fried yucca fries or cassava fries, you are in for a treat. Yucca is pretty much “tasteless” but absorb any flavor quite nicely. Hence the reason why I served it with Homemade Basil Pesto Dip! Also known as cassava, “is the third-largest source of food carbohydrates in the tropics, after rice and maize”. It is either sweet or bitter. Cassava can replace potatoes in many dishes and can be prepared in similar ways – it can be boiled, mashed, fried or baked. In South America, they call it yuca fritas! What are cassava fries or fried yucca? Cassava fries, also known as fried yucca fries, my friends, are famous in the Caribbean and in Latin countries. Similar to potatoes, cassava fries are cooked the same way as you would cook fries from potatoes. If you are wondering where to buy yucca? Yucca can be purchased at any local grocery store. The best part is, the nights you are feeling lazy or in a pinch of time, you can purchase a bag of frozen Yucca. I like it either way – frozen or fresh. Is cassava or yucca part of the paleo diet? Want to ditch the potato fries for something healthier? Well, if you are concerned about your diet and want to be sure things are maintained right within your body, you’ll be glad to know that cassava is fat-free. And because it is not a potato, and it is a rooted vegetable, it is part of the paleo diet. 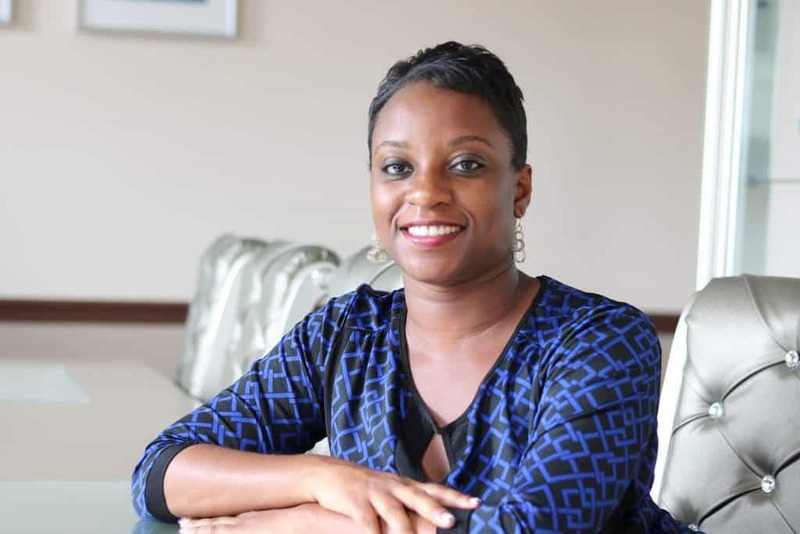 However, I do encourage you to do some research of your own or consult with your doctor. The best part about this appetizer that kept the family talking for hours, without realizing how much of the Fried Yuca fries they were munching on, is my amazingly easy Homemade Basil Pesto Dip. Seriously, guys, this sauce is so simple I don’t even want to call it a recipe. If you’re wondering what’s in a basil pesto? Here’s what you need to make it. Fresh lemon juice. That alone enhances the flavor of anything, in my opinion. Now you must be thinking, I gave you all of the ingredients to make this delicious sauce for you and your family to enjoy, but how do you make basil pesto sauce, right? Don’t worry, I got you. It’s pretty easy. 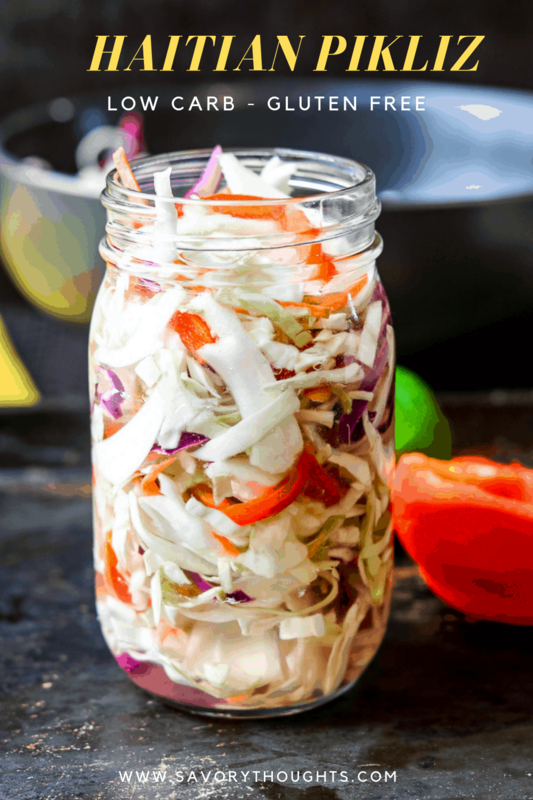 Just combine all of the ingredients in a food processor and pulse away! 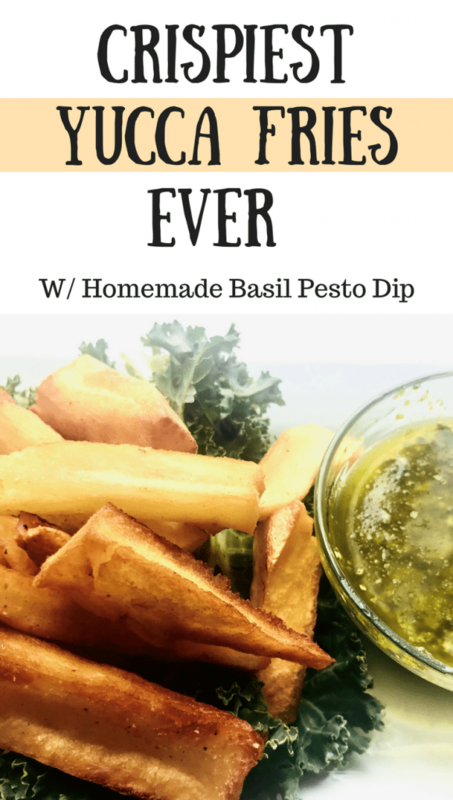 Take each fry, dip it in the homemade basil pesto dip and enjoy!! Don’t be afraid of change. Enjoy the confidence that comes from experience. 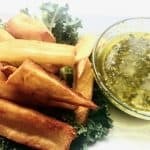 Golden Crispy Fried Yucca Fries Homemade Basil Pesto Dip. Seriously addictive Fried Yucca Fries. Fresh. Crispy on the outside. Soft on the inside. Extra virgin olive oil. Accompanied by Homemade Basil Pesto Dip. Fried Yucca perfectly seasoned with salt and pepper to taste. Crowd Pleaser! Heat the peanut oil in a deep frying pan. Cut the yuca in 1/2 - 3/4" batons removing the fibrous core. Fry the batons in small batches until golden brown on all sides. About 3 minutes. Remove from heat, set on a paper toweled plate and repeat the process. Combine all of the ingredients in a small food processor and pulse to desired texture. Place in a bowl, and enjoy with the Yuca fries! These fries are best enjoyed warm. If you are using fresh yucca to make the fried yucca fries, be sure to peel it properly, cut it into the desired size and cook it in a boiling water for about 5 minutes before frying. This method prevents them from being hard. 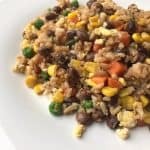 30 minutes or less Easy Fried Rice Recipe With Pigeon Peas. Addictive way to use leftover rice to create a one-pot meal. Friends, you know how much I love an easy meal. 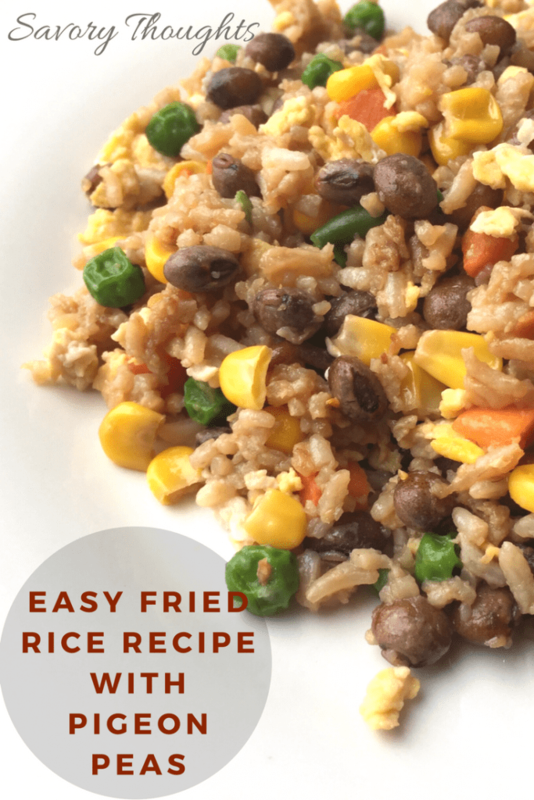 So today I am sharing with you how I turn leftover white rice into delicious Easy Fried Rice Recipe With Pigeon Peas. Saturdays are hectic for us with our children. After a long day at the gym for various reasons, by the time we reach home we are exhausted and hungry. So, I looked in the freezer and noticed I did not have any sweet peas but I found frozen mixed vegetables which has sweet peas. Next, I checked the pantry and found a small bag of pigeon peas. Perfect! 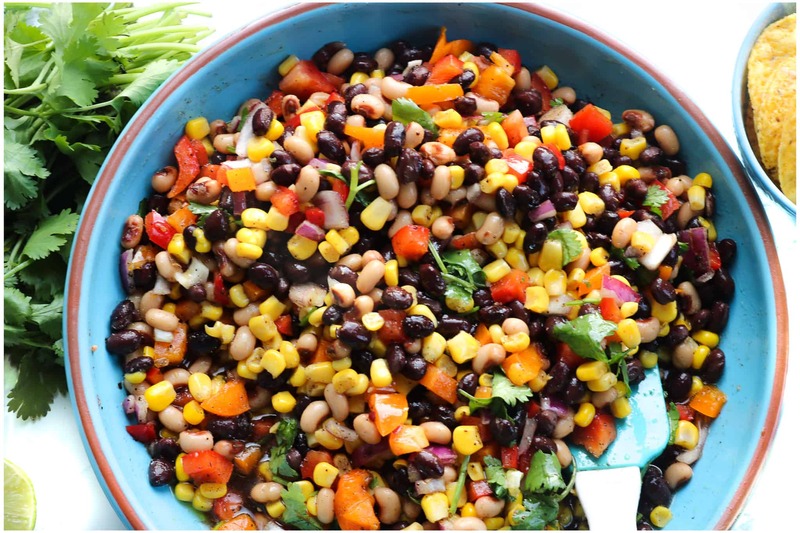 If you are not familiar with pigeon peas, they are famous in Asia, Africa, and Latin America. These peas are also known as Cajanus cajan, and it is a perennial legume. I know these peas are not traditionally used in fried rice, but I promise you will not even notice the difference. The great tip about fried rice recipes is that you can add whatever you want! 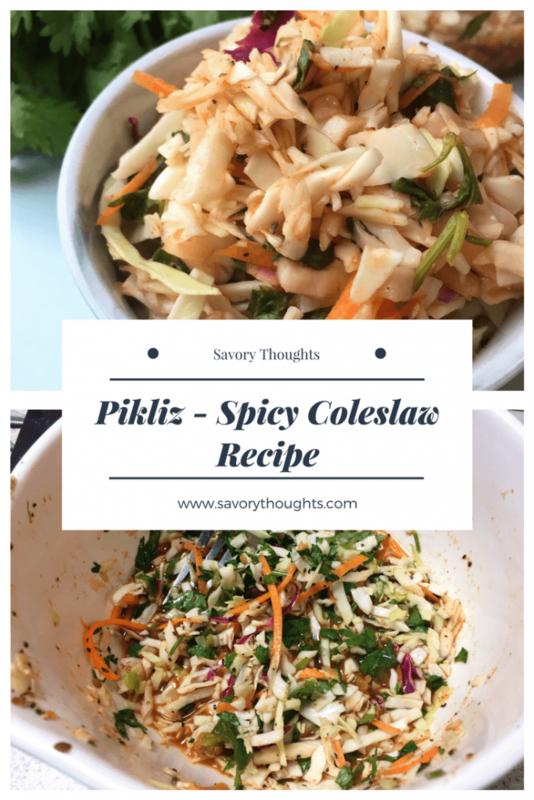 I improvise based on the ingredients I have in my cabinet, refrigerator/freezer, and or pantry. When making fried rice, I always use sesame oil and soy sauce. These two ingredients give the fried rice the authenticity I am looking for. 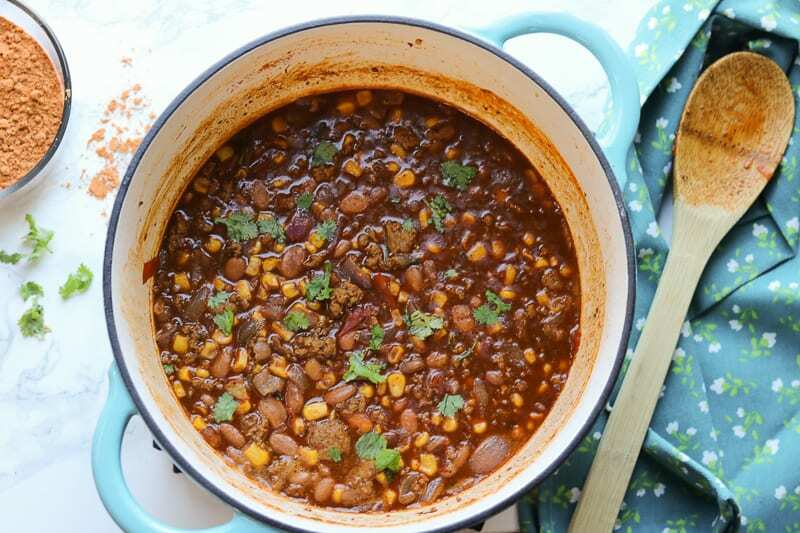 The key to this recipe is to make it yours! Scramble the eggs and set aside in a small bowl. Preheat a wok (or large skillet) to medium heat. Pour olive oil in the bottom. Add peas and mixed vegetables and fry until tender. Add the scrambled eggs. Mix well. Add the rice to the veggie and egg mixture. Pour the sesame oil on top along with the soy sauce, and season with salt and pepper to taste. Stir and fry the rice vegetable mixture until heated through and combined. 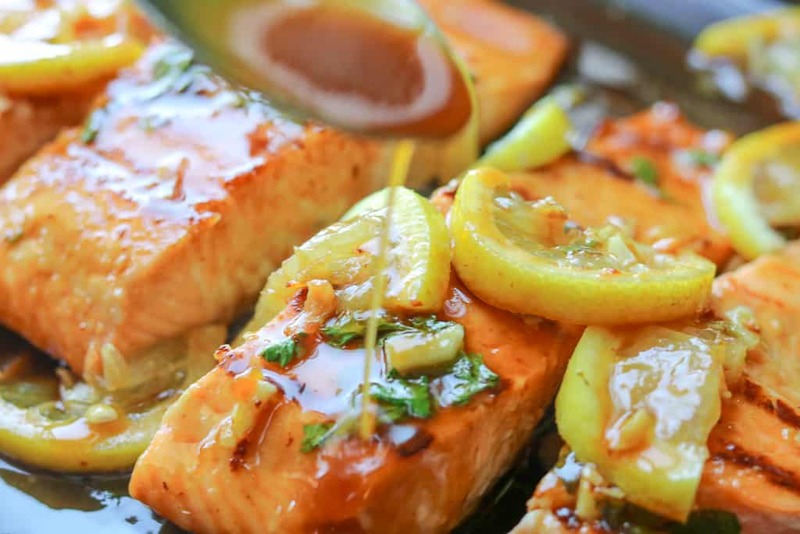 This recipe is perfect with added shrimp and or diced chicken breast.